Over the Summer, many supporters waited patiently for the sale of Liverpool Football Club. It didn't happen. The Club is now in an even more precarious situation with Tom Hicks attempting to place even more debt on Liverpool FC. 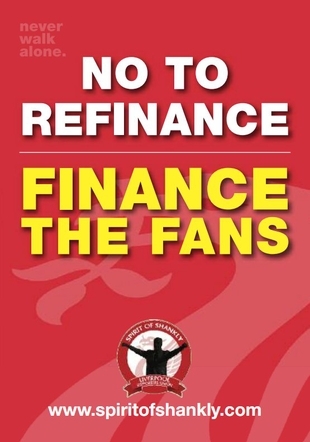 The Spirit of Shankly is now calling on RBS to refuse to refinance the debt currently leveraged on Liverpool Football Club. Spirit of Shankly has a solution to the current debt crisis at Liverpool Football Club. Supporters can join the growing campaign for supporter ownership by pledging their financial support towards owning a share of the Club. Spirit of Shankly's membership have voted in favour of this strategy and we want to encourage as many supporters as possible to get behind the campaign which sees supporters as the solution. Retain our focus making sure the owners never set foot in Liverpool again and they know that "Tom and George are Not Welcome Here"
Liverpool supporters worldwide are ready, willing, and able, to solve the current debt crisis and with commitment from RBS and the Club, the supporters can be the solution. You can download the original leaflet below. Thousands of SOS members around the world took part in our Not Welcome Here campaign. Did you? If so see if you can find yourself on the map.